4 Pics 1 Word flames fire cooking. Gas bomb. Fuel station. Forest with felled trees. Thanks for visiting 4-Pics-1-Word.com, here are the cheats for your favorite game. 4 Pics 1 Word flames fire cooking. Gas bomb. Fuel station. Forest with felled trees. 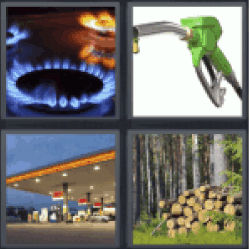 For easy and quick access to all answers of the game 4 pics 1 word add this page to your favorites list in your browser Four pics one word. Is this the cheat you’re looking for?